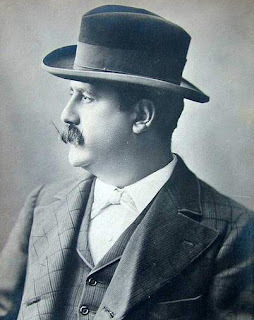 Ruggero Leoncavallo, the composer of the opera, Pagliacci, was born on this day in 1857 in Naples. Pagliacci - which means 'clowns' - is one of the most popular operas ever written and is still regularly performed all over the world. Leoncavallo also wrote the song, Mattinata, often performed by Enrico Caruso and still recorded by today’s tenors. Leoncavallo was the son of a judge and moved with his father from Naples to live in the town of Montalto Uffugo in Calabria when he was a child. He later returned to Naples to be educated and then studied literature at the University of Bologna under the poet Giosuè Carducci. Leoncavallo initially worked as a piano teacher in Egypt but then moved to Paris where he found work as an accompanist for artists singing in cafes. He then moved to Milan where he taught the piano and started to compose operas. After the success of Pietro Mascagni’s Cavalleria rusticana, Leoncavallo produced his own verismo work, Pagliacci. Verismo was a post-romantic operatic tradition, often featuring true stories about the lives of poor people. Leoncavallo claimed he had derived the plot for Pagliacci from a real-life murder trial in Montalto Uffugo, over which his father had presided. Pagliacci was an immediate success after its premiere at the Teatro Dal Verme in Milan in May 1892. The most famous aria, Vesti la giubba, which has been translated as ‘On with the motley’, was recorded by Caruso in 1902. He recorded it again in 1904 and 1907 and it is claimed to be the first record to sell a million copies. Leoncavallo went on to compose other operas and operettas, writing the words himself as well as creating the music. After he wrote Mattinata, he accompanied Caruso at the piano when the tenor recorded the song in 1904. Although Leoncavallo’s other operas are now hardly ever performed, arias from them are sometimes included in collections recorded by contemporary singers. Leoncavallo died in 1919 in Montecatini Terme in Tuscany, where he had a villa. His funeral was attended by Mascagni and Giacomo Puccini. The composer was buried at a cemetery near Florence but his body was later exhumed and moved by his descendants to Brissago in Switzerland, where he had also owned a residence. Teatro Dal Verme, where Pagliacci was premiered, was built in 1872 in Via San Giovanni sul Muro in north west Milan. The theatre was used for performances of plays and operas during the 19th and 20th centuries but is now mainly used for concerts, exhibitions and conferences. Montecatini Terme in Tuscany, where Leoncavallo had a villa, is a spa town in the province of Pistoia, dotted with formal gardens and with a variety of architectural styles on display because of the different spa establishments. Its heyday was the early part of the 20th century, when restaurants, theatres, nightclubs and a casino were built here and many celebrities visited. As well as Leoncavallo, the town welcomed the composers, Giuseppe Verdi and Mascagni, and the tenor, Beniamino Gigli.